We have just completed our contracts with Paradise Taveuni, and we are spending the next couple of months with family on Fiji's main island of Viti Levu. Jack has completed a plethora of projects for the resort, and we're excited to see the printed materials and products. Here are some samples of brochures Jack has designed for the resort. They will be used for promotions within Fiji, Australia, the U.S., New Zealand, and other locations. Last week I completed my Open Water Dive Certificate at Paradise Taveuni through Pro Dive Taveuni! It was a truly unforgettable experience, and a fairly easy thing to do. Pro Dive offers an extensive selection of courses, dive gear and sites; and is operated by a professional and knowledgeable Dive Team led by PADI Dive instructor and resort owner, Allan Gortan. 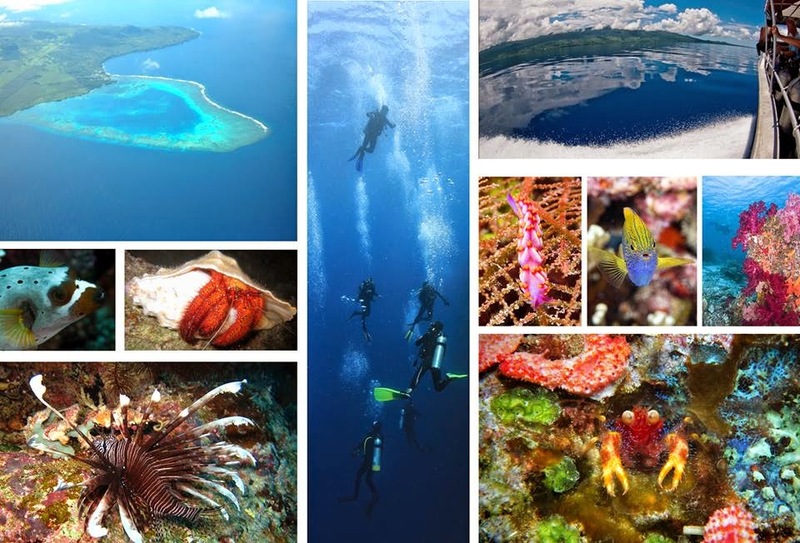 Pro Dive Taveuni also has a fleet of custom made boats that provide access to the pristine reefs surrounding the Garden Island of Taveuni. The Course: Step One: Snorkel off the pristine waterfront at Paradise, where you can witness the labyrinth of lava flow covered by various hard and soft corral. There are innumerable fish from the majestic Parrot Fish to the elusive Leather Jacket. Here, your thirst will grow to explore more. Step two: Take your Dive course which you can purchase and complete online. This gives you the flexibility to work at your own pace, anytime, anywhere within a 12 month period. I was very fortunate as I was presented the NASE online dive course as a wedding gift from Alise's family friends (owners/operators of Cocoa Beach Scuba Odyssey) who were also her instructors. I was also lucky to catch NASE instructor, Mark Santa-Maria on his last few days at Paradise. The course will introduce you to the fundamentals of diving- the various techniques, dive theory, and worst case scenarios. There are risks with diving, but if steps are followed diligently, you will have an amazing time. Once you have finished all your reading and/or watching videos, you will take an exam, answering various questions about diving and having a safe enjoyable dive. Step Three: The Practical. Here you will put to test the skills and knowledge you learned from the online course. The first two sessions will take place in the safety of the pool. Your instructor will show you everything from setting up your gear to how to enter the water, fixing problems underwater such as clearing your mask, runaway regulators, and the special hand signal signals used to communicate specific situations and directions. Step four: Time to get in the Ocean. To complete your open water course you must log 2 shore dives and 2 boat dives. Here is where you really get to apply your new set of knowledge and skills like 'diving like a fish'. As the reef is a delicate system of hard and soft corrals, aquatic life and things that could hurt you if not careful, it is important to maintain neutral buoyancy using your lungs to ascend or descend. Nowadays, divers are equipped with a handy dive computer that tells you your depth, ascension rate, and dive time and features a convenient safety stop timer (safety stop: 15ft or 6-4.5 meters below the surface where you wait for 3 minutes so the nitrogen in you body safely leaves your blood stream). When you follow all the steps and procedures you can have the time of your life. Once you have completed your dives and logged the necessary time, that's it! You are now certified to dive anywhere in the world. As a final test and introduction to the deep, my instructor took me down to 100 feet, and acted out a panicked diver scenario that just ran out of air! Thanks, Mark. Succeeding in this left me feeling confident and eager to explore more of the underwater world! 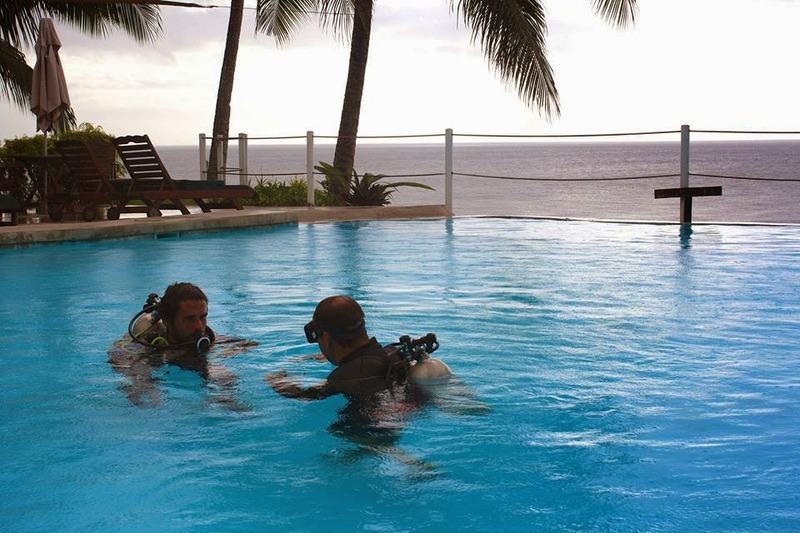 Click here to find out more how to get Certified to Dive at Paradise Taveuni. Taveuni, the third largest island in Fiji, has a total land area of just 169 square miles (434 square kilometers). Yet, the challenges of transportation (untimely buses, rocky roads, work schedules, etc) keep us on the south side of the island, usually at the resort.One weekend we did manage to get out for a lovely getaway to the north side. We went to see our friends, Keni and TC in Matei. It was only about an hour’s drive from the resort, and well worth it. We met Keni and TC in the states- he is Fijian and she is American. Jack first met them about 10 years ago, when Jack was working at Peet’s Coffee in Oakland. Jack was wearing his sulu vataga to work, and Keni was waiting in line. Keni spotted the sulu vataga and yelled “BULA!! !” The rest is history! 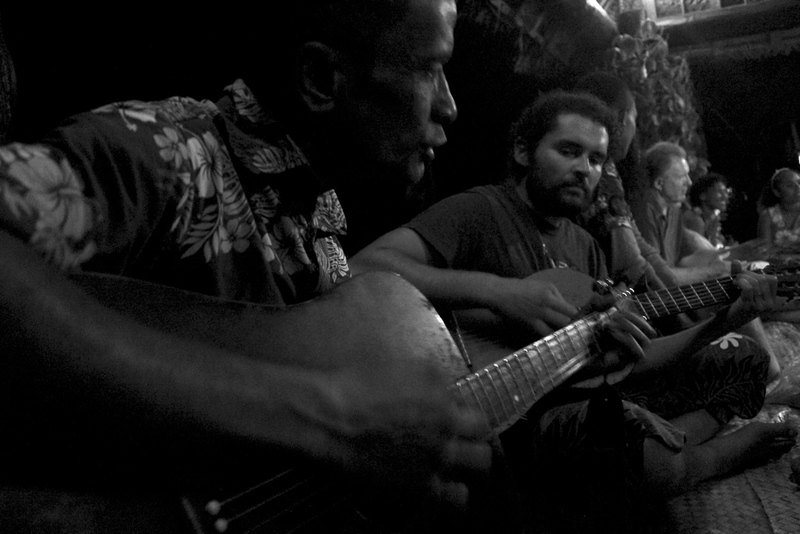 Keni is from Taveuni and this is where he and TC met. 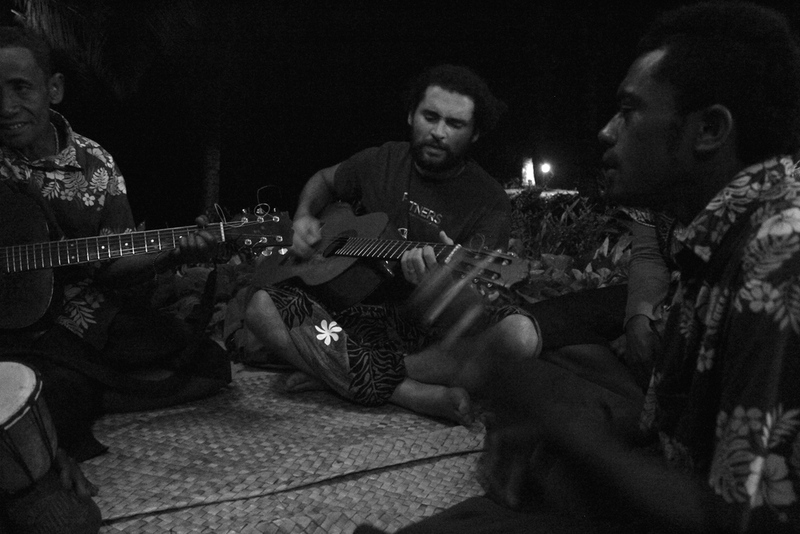 They currently live in Oakland but still have their home on the northern side of Taveuni. 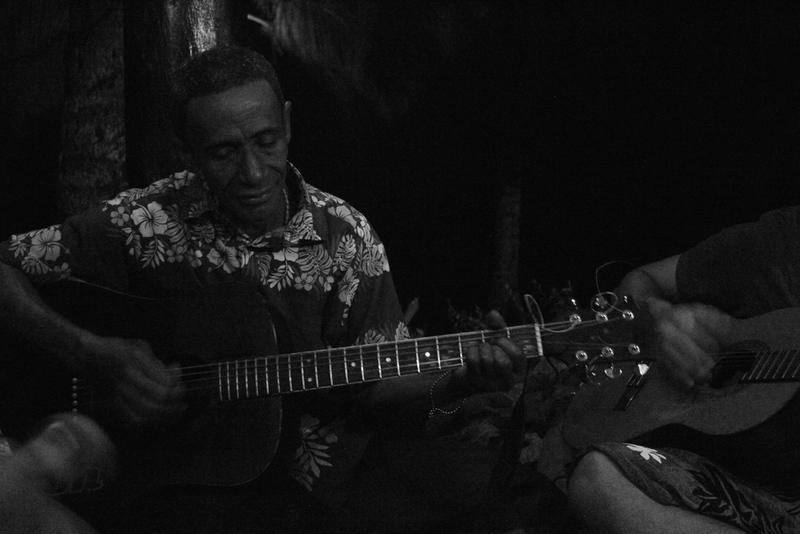 When they came to Taveuni, they invited us up to see their beautiful home and the surrounding area. Even though it's relatively close, the north side of the island has a very different coast. It was actually our first time stepping on a sandy beach since we’d been in Fiji! Down where we are, there are volcanic rocks, but no sand. Keni and TC took us out kayaking to a nearby island. The views were absolutely breathtaking! They also hooked us up with a supply of some of our favorites: uto (breadfruit), jina (bananas), papaya and bu (coconut)! October 10th marks Fiji Day in the Fiji Islands. This is the anniversary of two events. The first was October 10, 1874 when Fiji became a colony of England. Within a few years, the English sent indentured laborers from India to plant sugarcane in the islands. The second is October 10, 1970 when Fiji became politically independent of England. Wouldn’t it be great to have a flag that portrayed Fiji’s diverse history and landscape beyond the relatively short history of British colonialism? We could say the same of most countries I’m sure. For Fiji day, my students designed new Fiji flags including their own symbols for love, respect, natural beauty, Fijian music, and community. Several days ago, I took photos of my students and told them to do a silly face and include both of their hands in the frame. We did this in between classes and I did not tell them what this was for. I was aiming for images to use for this week’s Gustave Courbet inspired self-portrait. This week in school, we looked at the history of self-portraiture, and explored visual and narrative techniques employed by old masters and contemporary artists. I gave the kids the printouts of their black and white photographs and they created a 1” grid. They then worked to recreate their images grid by grid. We had previously done a lesson on gray-scale and they used their gray-scale cutouts to help find the lightest and darkest parts of their photographs, and illustrate highlights and shadows. The final results were great- really cool compositions that they were proud of! ***I may have helped on one of these. 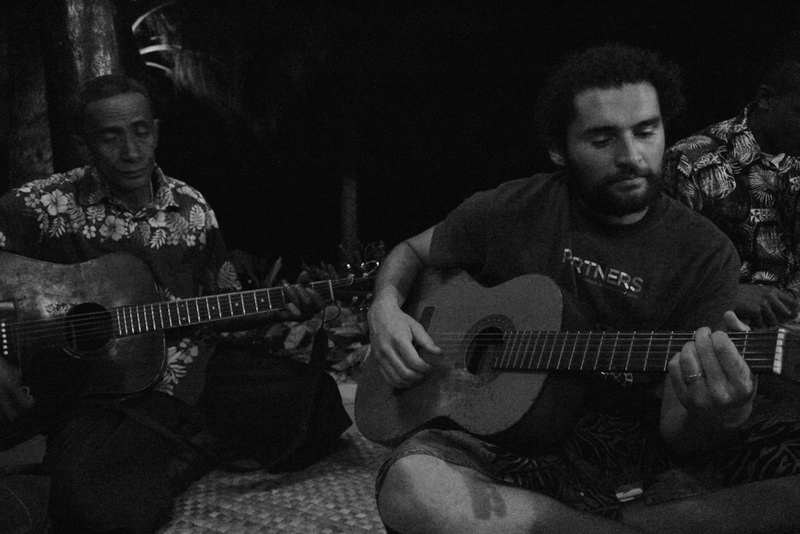 We’ve just completed our first week of work at Paradise Taveuni! Check out the Paradise blogpost Jack posted here: fijiresort.blogspot.com Paradise Taveuni is located on the Southern Side of Taveuni. We made our first day trip north to Bouma Falls with five kids and a group of resort guests. It took a couple of hours by car, with stops along the way. Our first stop was the beautiful cathedral, which is celebrating 150 years next week. Our next stop was at the International Date Line. Here we were able to stand in today and yesterday. Then we made it to Bouma Falls. There were three waterfall stops and we hiked to the first two. The walks were beautiful and good exercise. The water was very cold, but it felt refreshing after the journey. On the way back, we stopped at the natural waterslide. The water here was warmer…or maybe we were just acclimated by that point. It was a nice, full day and the kids were knocked out for the trip back. We’re looking forward to exploring more of this beautiful island! Bula from Taveuni, Fiji! This week was a long one, full of travel. Sunday, we flew from San Francisco (SFO) to Los Angeles (LAX) then to Nadi, Fiji (NAN). Packing food is always a challenge for us, but luckily we’ve found a go-to gem in LAX. It’s called “Real Food Daily: Organic Plant-Based Cuisine” and it’s in Terminal 4, where American Airlines is. We stumbled upon it when we were coming back from Fiji last December. They serve large portions of fresh organic vegan meals with toppings like cashew cheese and avocado. We had the LAX Bowl, the Southwest Salad and a bottle of water and the total came to around $40. It’s definitely steep (airport prices! ), but the portions were huge, and held us over through our 11 hour flight. We arrived in Nadi on Tuesday morning. We caught a bus from Nadi to Suva and spent time with family on both sides. We spent Tuesday night on Jack’s parents’ farm in Naitasiri and then flew out of Nausori (near Suva) airport on Wednesday afternoon. The plane had 7 rows, so we sat right behind the Captain and First officer. We arrived into Taveuni’s Matei airport late Wednesday afternoon and met our coworker who drove us to the resort. We arrived after dark so we weren’t able to do much exploring. Thursday morning we woke up and were able to see the beauty of the resort. I’m pretty surprised at how cold it is. Luckily, Jack had me pack a hoodie and a cardigan; otherwise I’d be freezing! We've jumped right into work so we’ll be getting organized and posting more soon! Bula family and friends! 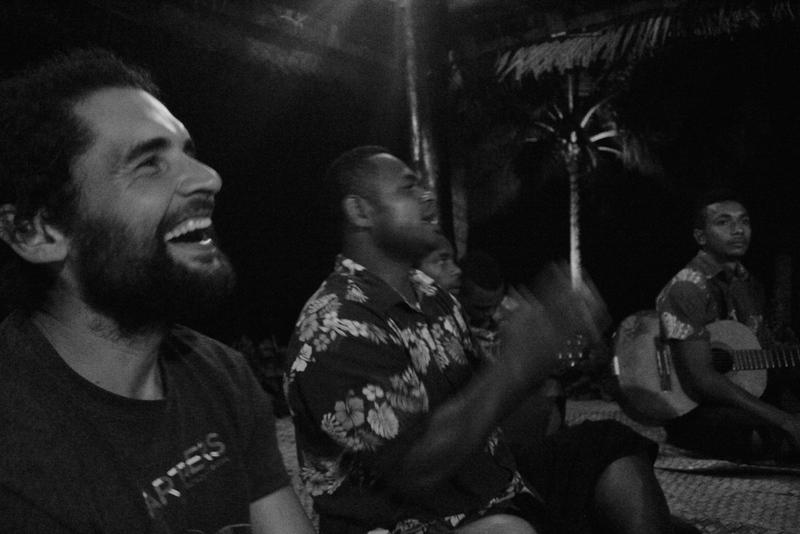 We're excited to announce that we will temporarily be moving to the island of Taveuni in Fiji! We will both be working and living at Paradise Taveuni, a resort on the Southern side of Taveuni. 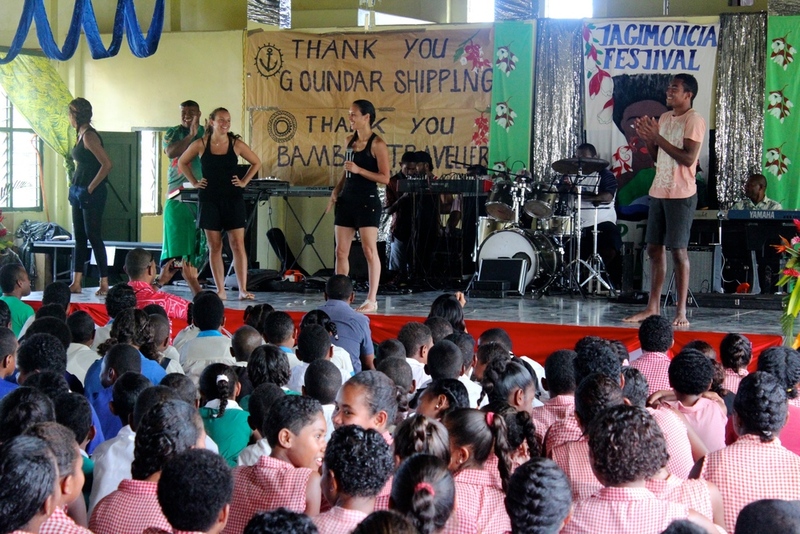 Taveuni is the third largest island in Fiji, known as the Garden Island for its flora. Jack will be working as a web developer, and Alise will be teaching the resort owners' children. We could not have dreamed up a more fitting opportunity! 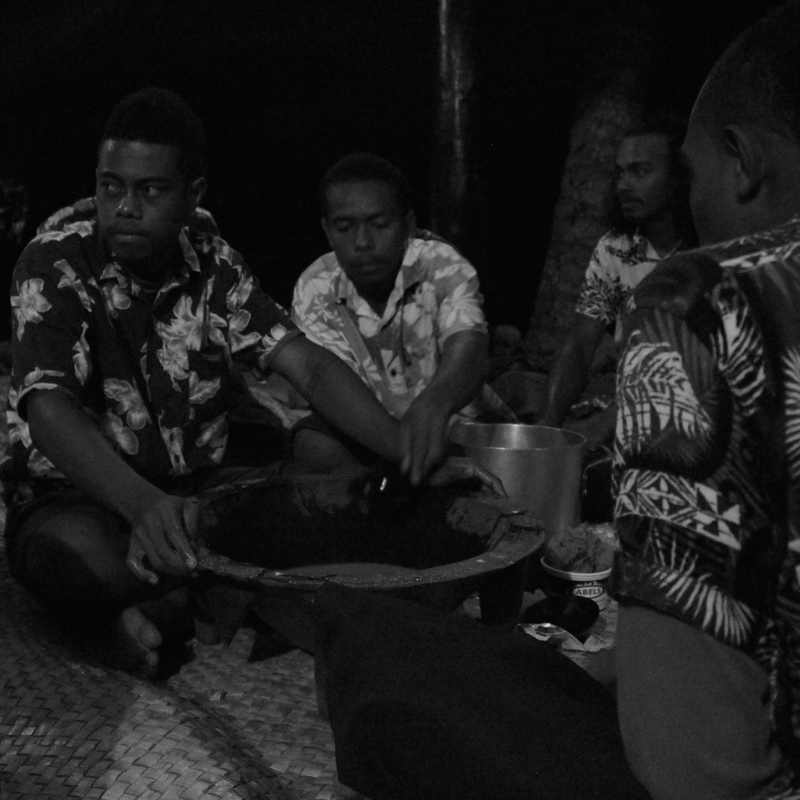 In our free time, we plan to explore vegan food options and growing and composting in Taveuni. We plan to create art, inspired by our experiences. We also plan to do a good bit of exploring, swimming and diving. And of course, we will take heaps of photos and journal along the way so that we can keep this updated. We'll be taking a break from our Etsy shop but our art and jewelry will still be available in a few locations. Contact us for more details! With new opportunities come uncertainty, and we’ve been consistently working to embrace the changes and transform our fears into loving situations. We’re blessed to have such a strong support system of family and friends. Alise’s parents are caring for our pup Zoey in California and Jack’s parents are looking out for us in Fiji. We fly out in July. Until then, we are living and working in the East Bay, getting Zoey settled in with Alise's parents. Stay tuned for updates!